Dominic Barnard, managing director of VirtualSpeech, is currently out in America as part of a three-month programme to network and help his technological ideas progress. The businessman is working with experts as part of Boost VC, one of the top Virtual Reality (VR) accelerators across the globe. Dominic created two mobile phone apps, called Public Speaking VR and Language VR, which immerses the user in a virtual world and helps them improve their communication skills. But none of this could have come to fruition without the help of the Business Ready programme, which is being delivered by the University of Warwick Science Park as part of the Coventry and Warwickshire Business Support Programme. Dominic said: “VR is fairly specialised at the moment so I wanted to work around other VR start-ups to understand more about the technology and business from different perspectives. “The programme is helping me to define a product market fit, has given access to a huge VR network in the USA and the chance to meet with successful entrepreneurs from a range of industries. Dominic set-up VirtualSpeech in 2016, when he decided to strike out on his own after working with the technology at Jaguar Land Rover (JLR) for more than two years. Although there was a huge amount of interest for his apps, Dominic felt that he needed help and advice as this was the first business he had set-up. Dominic was mentored and worked with Dirk Schafer from Business Ready on various aspects of the business including digital marketing. Thanks to the help of the scheme, Dominic’s apps have already gained a great deal of attention from the likes of The New York Times, Forbes, VentureBeat, Inc and other top news sites. Not only that, they have also been downloaded more than 100,000 times and counting and led to him applying and being accepted for Boost VC – which will help build the business and get its name out there to an international market. “Business Ready has been a huge asset and I am so grateful that there is something out there like that for firms to access,” added Dominic. “Dirk and the team have so much knowledge and expertise and I would recommend the programme and the help to anyone. 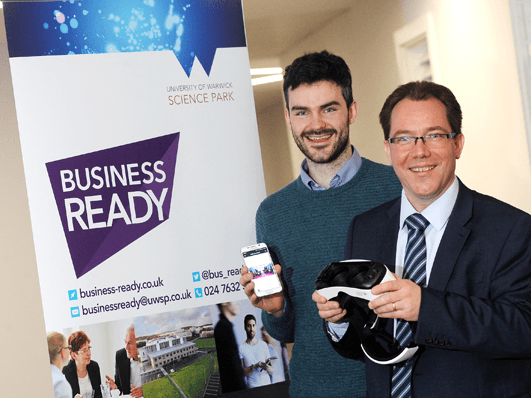 Dirk Schafer from Business Ready, said: “What Dominic has done is tap into a market that has not been used for virtual reality and it is a fantastic and impressive idea. “Business Ready and Dominic have worked extremely well together and it is fantastic to see such positive results for the firm and its work. “Boost VC will now take Dominic’s work to the next level and introduce it to a whole new audience, which in turn will strengthen the business in the UK. For further information about the Business Ready programme visit https://www.business-ready.co.uk/.